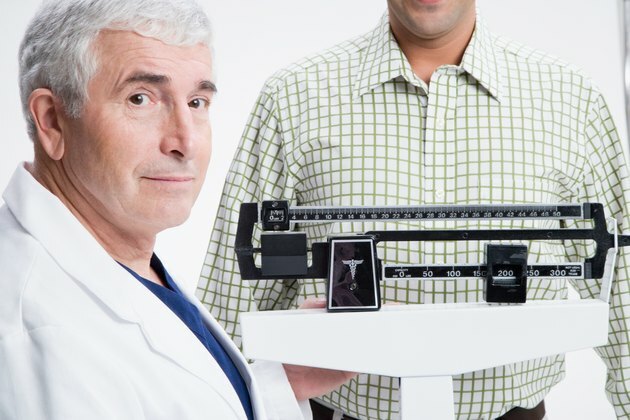 When men approach middle age, they tend to gain weight, especially around the midsection. While this is avoidable, several factors fall into place during this time of life, leading to an increase of fat storage and loss of muscle tone. Understanding the causes of middle aged weight gain in men is imperative before you can lose the pounds. As you hit middle age, it's likely that your metabolism will start to slow down. This means you burn fewer calories per day than you did when you were younger at the same activity level. If this is maintained, you could gain several pounds a year, resulting in an ever-expanding waistline. Your muscle mass also decreases as you get older and it plays a direct role in your metabolic rate, meaning your metabolism will slow down even more. A reduction in testosterone level is also common in men as they reach middle age. Though a normal part of the aging process, the lack of testosterone can cause a loss of muscle, fatigue and weight gain, further causing men to pile on the pounds as they leave their 40s and enter their 50s. As men get older they might eat a more unhealthy diet or as their metabolism slows, the diet they've always followed could result in weight gain. One particular culprit is alcohol consumption. Drinking alcohol, especially beer, often could result in an increase of abdominal fat. Eating an excess of refined sugars like white flour can also contribute to an increase of fat in middle age. Eating other high-calorie foods also contributes. Whole milk may be particularly contributing to middle age weight gain, as those who drink skim milk actually lose weight at a faster rate. A slowed metabolism and loss of testosterone in middle age can make you feel tired all the time, which makes it difficult to work out with any sort of regularity. According to the American College of Sports Medicine, you need at least 30 minutes of cardiovascular activity five days a week and 20 minutes of strength training three times a week to be healthy and to lose weight.